On this day in the year 1945, a 14-year old Italian seminarian named Rolando Rivi died as a martyr in a little town called Monchio, in the province of Modena. Rolando was born in 1931, and began serving Mass at the age of five; he made his first Communion on the feast of Corpus Christi, June 16, 1938. 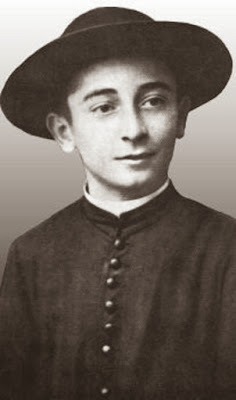 In 1942, at the age of 11, he entered the minor seminary at Marola, and was admired by his teachers as an exemplary student, and a boy of sincere and serious devotion. As was the custom in those days, he was clothed in the cassock, and wore the saturno as part of the regular clerical dress; already at that tender age, he expressed the desire to become a missionary. He was noted as both an excellent singer and musician, and participated enthusiastically in the seminary choir. On April 10, 1945, a group of these partisans kidnapped Rolando as he was studying in a little grove near his home; his parents discovered both his books and a note from the partisans warning them not to look for him. He was taken to a farmhouse, beaten and tortured for three days, under the absurd accusation that he had been a spy for the Germans; he was then dragged into a woods, stripped of his cassock, and shot twice in the head. The partisans rolled his cassock up into a ball and used it to play soccer. I make bold to suggest that Bl. Rolando is a good person to appeal to if you know any seminarians who need prayers, and especially those who are persecuted for their love of the Church’s traditions; and further, in preparation for next year’s Synod on Youth, that it would not be a bad idea to consider what it was about the Church that Rolando Rivi lived in that enabled him to face martyrdom so bravely at the age of only 14. Beate Rolande, ora pro nobis!